We’ve seen lots of crime stories about the guy who’s in over his head, the guy who wants to do right but has to pull that one last job or pay off a debt to the mob. 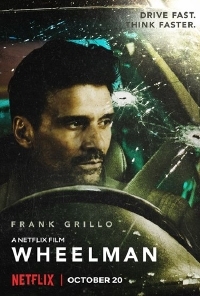 In Wheelman, Frank Grillo’s getaway driver finds himself in a familiar predicament when he’s set up and forced to bolt in the middle of a bank robbery, making himself a target for the mob, his abandoned passengers, and a mysterious phone caller who seems to be pulling all the strings. What makes the film work so well is that writer/director Jeremy Rush, producer Joe Carnahan and their excellent cast are as aware of the old tropes as we are, and have stripped everything down to the leanest possible components. Wheelman, like its main character, doesn’t take its foot off the gas very often, and is really a feature-length third act, one in which things like exposition and backstory are boiled down and doled out in just a few tight exchanges of dialogue. Grillo’s Driver spends close to the entire film in one car or another, and almost that much time on his cell phone, as he drives around the city trying to identify the mystery caller and dodge the occasional assassin. This isn’t a strict one-gimmick film, but a large portion of the film is shot from within one car or another, almost as if the vehicles are characters themselves, and the pace is just shy of real-time. It works, largely because it genuinely services the story, giving us a real feel for the Driver’s job and gradually making us just as claustrophobic as he is. Grillo is one of the best tough guy actors working today, and if you don’t know him by name, you probably recognize him from two Captain America movies and two Purge movies, or maybe from his excellent performance in Warrior. He’s got real depth and range, one of those rare actors whose characters seem to have lived real lives before we ever meet them, combined with a physicality that’s becoming all too rare in a movie industry where men seem less and less male every day. His co-stars are top-notch, too, especially Garret Dillahunt as a desperate middleman and Shea Whigham as one of the abandoned bank robbers. This is the kind of cast you want when making a modern, hard-boiled crime thriller, and it would be really cool to see them all get together every couple of years to make a new movie and remind Hollywood how it’s done. A real testament to the power of minimalism, Wheelman finds that sweet spot where economy of style and story nicely compliment each other. It sits high on the list of car-bound crime films, and actually makes movies like Drive and Baby Driver, as good as they are, seem kinda tame by comparison. One thing’s for sure: Ryan Gosling would lose in a fight with Frank Grillo. Good name for an action film director.